Aaron McKay Bagley, Lieutenant, born Aug. 26, 1921, Lincoln, NE. Received two years of college at Golden West College in California. Joined the USN Aug. 4, 1940, with boot training at Great Lakes, IL. Assigned to USS West Virginia to QM gang. Dec. 7, 1941 - he was in steering aft getting ready to go ashore (for a date with a Japanese girl) when GQ sounded. He raced topside 10 seconds ahead of the torpedo that blew the rudder off the ship. His station was the bridge, but he never reached it. Assigned briefly to ammunition detail then shifted to removing dead and wounded. When ship became engulfed in flames, they were ordered to abandon ship and he ended up at sub base, was issued a rifle and told to shoot at anything that flew over their position. Along with two great shipmates, Wally Morgan and Frank Mazejka, he was assigned to USS New Orleans (CA-32) Dec. 9, 1941, and served aboard until Feb. 2, 1945 (earned 16 Battle Stars). Memorable battles: Midway, Coral Sea and the last major sea battle in the arena of the Southern Solomon's with the engagement of Japanese ships, the Battle of Tassafaronga. The New Orleans was torpedoed and lost 1/5 of the ship and a great many lives. Was a navigator on USS Talladega (APA-208) landing Marines off coast of Vietnam, 1966-68 (earned three Battle Stars). Was OIC NAVBROCEAN Vietnam, 1969, and awarded Vietnam Staff Service Medal. His 30 year career covered a variety of duty assignments: NAVSTA Rodman CZ; NAV EXAM CTR Great Lakes; ships: BB-48, CA-32, CV Hornet, NROTC V12 Unit, AG 132, PCE 895, ATF 98, DDs: Amen, Stembel, Ernest G. Small, Talladega APA-208, OIC NAVBROCEANO, San Francisco, San Pedro, Saigon Vietnam. 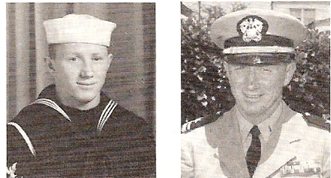 Lt. Bagley was discharged at Long Beach Naval Station in November 1970. Married Laura V. Sprouse (Navy nurse) in June 1949. They have one child and one grandchild. Bagley lives in Westminster, CA, and is a manager of a nursery. Hobbies are bowling and golfing. See Aaron Bagley's account of the events of December 7, 1941 on the Stories page.